O.P.I 'Chip Skip' is my new little savior when it comes to keeping my nail varnish in place for a working week at the office. 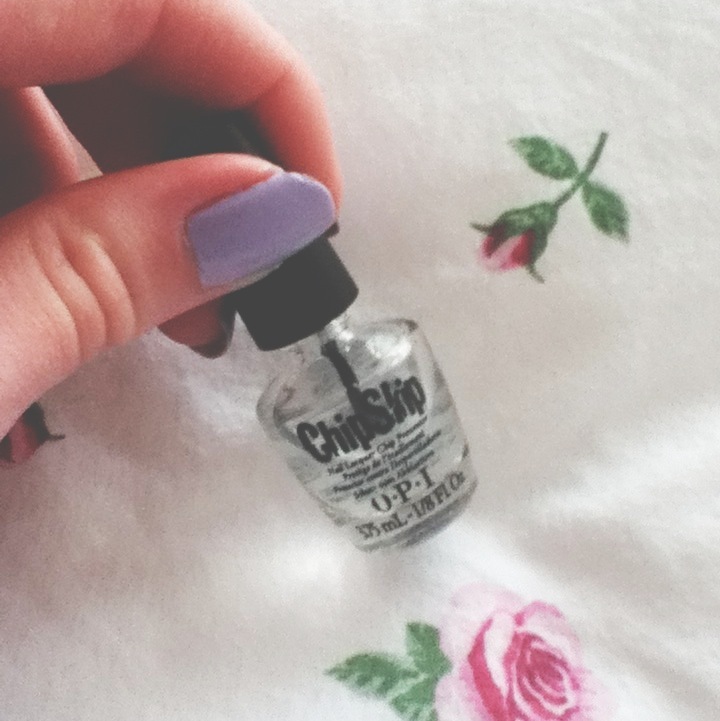 I received Chip Skip in one of my nail sets for Christmas. I normally always opt for my trusty (would say 'holy grail' but I hate that term) O.P.I 'Nail Envy' but I decided to use Chip Skip instead on a whim. Now, it does state that you are supposed to apply this product before using your base coat/lacquer but the consistency is so thin, that I wanted to try it as a top coat/sheen! You don't need to use a huge amount to get results - it is literally like applying water to your nails. As you can hopefully see, my nails do have a shine to them! I applied Chip Skip to my nails after two coats of Essie 'To Buy or Not To Buy' - the outcome didn't make my nails look quite as thick/heavily-coated as when I use Nail Envy, however. I found that Chip Skip dried incredibly fast, which is something I always appreciate when I'm trying to do my nails in a hurry on a weekend. Throughout the week, I have also tried giving my nails a top up and they have become noticeably stronger! That's seems like such a great product, because I always end up chipping my nails REALLY BAD the day after I painted them and it gets me soooo annoyed! Your nail polish colour is so pretty! *That seems, without the 's, hahaha woops. This seems like a really good product, its so frustrating when you paint your nails and they chip. And I love the essie lilac nail polish the perfect pastel shade. Great blog. Ooh I like the sound of this!